iGrow: A Revolution In Hair Loss Treatment for Men and Women! Brand new to StressNoMore is the iGrow Laser Hair Rejuvenation System. Designed for both men and women with hair thinning and hair loss, the iGrow uses a revolutionary combination of LED and lasers to give Low Level Light Therapy (LLLT) to stimulate the regrowth of thinning hair. iGrow is the world's most advanced hands-free hair rejuvenation system and combines the results of decades of research into hair loss - and their claims are supported by hundreds of clinical studies. Trials showed that within 12 weeks of using iGrow as directed, hair loss had ceased, and within 24 weeks, hair appeared thicker, fuller and healthier. Unlike some other products on the market, the iGrow is designed for both men and women. Did you know that by age 35, some 40% of men will show noticeable hair loss? And even more surprisingly - 40% of middle-aged women suffer from female-pattern hair loss! The iGrow features programmes designed especially to target male and female hair loss in different ways. The iGrow is easy and comfortable to use, and unlike traditional laser combs, it's hands-free, leaving you free to get on with your life! 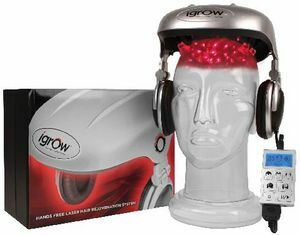 There's even the option of connecting your iPod or MP3 player to iGrow's built in headphones so you can relax and listen to music while iGrow works to rejuvenate and revitalise your hair. Treatment takes just 20 minutes, two to three times a week - it's easy, convenient and fuss-free. iGrow also offer a range of accessory products to maximise results from the iGrow unit. The iGrow shampoo and conditioner provide gentle cleansing and optimum scalp conditions for hair regrowth, and the iGrow Vitamin Supplement contains a special blend of vitamins, minerals and herbal extracts, designed to promote strong, healthy and vibrant hair and give your body a helping hand during your hair rejuvenation programme. What about the cost? At £485, you may think that the iGrow is a big outlay. However, if you consider the cost of alternative hair loss treatments, the financial benefits are great too. When you consider that the leading Minoxidil hair loss treatment available on the high-street costs £400 for a 12 month supply, the one-off cost of the iGrow pales into insignificance. The iGrow is a one-off payment and can be considered an investment for the future of your hair. What can iGrow do for you? It's been proven that most men and women suffering with genetic hair loss/hair thinning will benefit from low-level lasers, so rather than taking more drastic action, try iGrow, the new revolution in at-home hair rejuvenation.